If you are handyman, carpenter, metal worker, or home hobbyist, or even just a DIY kind of person, you need to have the right tools in your arsenal. One of the tools which most would agree is an essential part of any kit is the drill press. Drill presses are very useful, and they can be used for a variety of purposes, with drilling holes just being one of them. With that being said, finding a good drill press is much easier said than done; this is especially true when it comes to finding one that won’t ruin your budget. So, let’s get right to it and help you find a the best drill press that your money can buy. 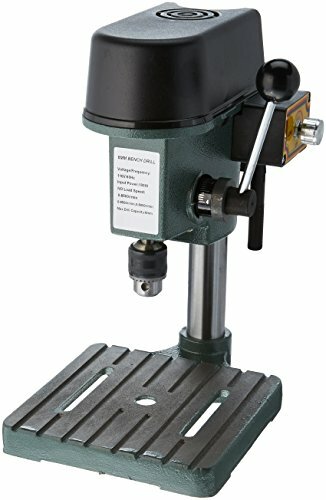 If you need an affordable drill press, one that is quite durable, easy to use, and can perform quite a few tasks, the WEN 4208 Drill Press is a great option to keep in mind. The WEN 4208 Drill Press features a 120 V motor with 1/3 horsepower. Admittedly, this is not all that powerful, but it should be more than enough for most basic drilling needs. Moreover, this drill press features an 8-inch swing, which should also be more than space for most of your basic drilling needs. This item includes a ½ inch keyed chuck that makes bit changing easy, plus it comes with an onboard bit storage system. 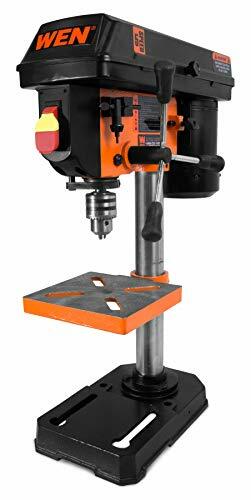 The WEN 4208 Drill Press comes with a 6.5 x 6.5 inch work table. It’s not huge, but once again, should be more than ideal for most basic needs. The height of the work table is adjustable, plus it can bevel up to 45 degrees, both to the left and right. The WEN 4208 Drill Press has a spindle which can travel up to 2 inches. It has easy-to-read and adjust linear depth locks for precise drilling. This is good for operations where you have to repeat the same drill depth over and over again. We like how this drill press has 5 speeds to choose from. The speeds range from 740 to 3,140 RPM, which is quite impressive. If you only need a really small drill press for basic at home needs, one that is very affordable, but also quite durable, you might want to check out the Gino Development 01-0822 TruePower Mini Drill Press. We like the Gino Development 01-0822 TruePower Mini Drill Press for a couple of reasons. First off, it is fairly small, lightweight, and thus quite portable. It still has a good weight to it, but it’s not like other drill presses that are purely stationary. With that being said, this item is fairly small, so it does not have the power that larger drill presses have, but it still comes in at 110 volts. The Gino Development 01-0822 TruePower Mini Drill Press features a 6.75 x 6.75 inch work table, which is a decent size. The work table is not adjustable, which is a bit of a drawback. The spindle can only travel 1 inch, which is fine for small and basic needs, but not for larger jobs. Keep in mind that the room you have to work with here is a bit limited. What is nice about the Gino Development 01-0822 TruePower Mini Drill Press is that it has 3 different speeds. These include 0 to 5,000 RPM, 0 to 6,500 RPM, and 0 to 8,500 RPM. It’s impressive that this drill press can reach these speeds, even though it has a small frame. It comes with a standard chuck and chuck key, plus it can accommodate drills between 0.79 to 6 mm in diameter. 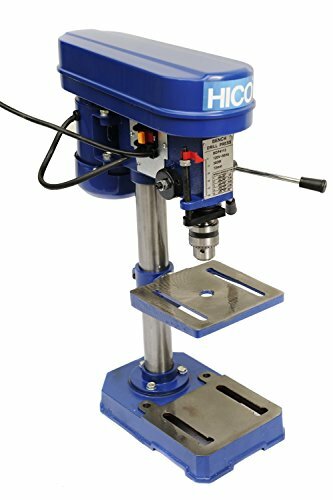 The HICO Bench Top Drill Press is an affordable, medium-sized, adjustable, and fairly powerful drill press to go with. It’s a pretty standard tool, but it definitely gets the job done. The HICO Bench Top Drill Press features a 6.5 x 6.5 inch cast iron work table, so it’s definitely durable. The height of the work table can be adjusted, and it can bevel left and right 45 degrees. Here you have 8 inches of height to work with, which should be enough for most basic needs. The HICO Bench Top Drill Press comes with 5 speed settings for a lot of versatility. It can go between 750 and 3,070 RPM, which is not bad for a fairly small drill press. It also comes with a 2/5 horsepower induction motor. It’s not the most powerful, but should be enough for your needs. Keep in mind that this drill press weighs upwards of 32 lbs., so it’s not exactly a portable power tool. This item comes with a keyed chuck system that is easy to use, plus it comes with the tools for assembly. Moreover, the spindle on this drill press can travel 2 inches. It also features easy-to-read depth lockouts for precise drilling and repeated drills. The HICO Bench Top Drill Press can handle wood, metal, and plastic and it is absolutely a practical power tool. So, if you need a good drill press, one that won’t ruin your budget, but is also quite durable, has a decent amount of power, is versatile and highly adjustable, we would personally go with the WEN 4208 Drill Press. It can handle some fairly decent sized jobs. However, if you just want something small and very affordable for small drill press jobs, we would recommend the Gino Development 01-0822 TruePower Mini Drill Press.